Samsung’s own artificial intelligence assistant is yet to officially launch in the US or UK despite the company claiming it would launch by the end of Spring 2017. Unnamed industry sources have told The Investor that the tech hasn’t been released in the west thanks to a “lack of resources”. Bixby Voice is currently only available in South Korea. The delay is reportedly related to a lack of data for the voice assistant as well as foreign language experts to translate the service from Korean. A beta version of the software is currently available in the US for those who signed up to an early access program, but that’s still a very basic version of the AI assistant. Samsung said of the delay, “We are still working on improving the linguistic skills in order to provide a more advanced AI assistant that meets user needs.” TechRadar has asked Samsung for an updated release date and we'll confirm in this article when we hear back. It seems Samsung wants to ensure the tech is working perfectly before launching it officially but considering the company has teased Bixby Voice in the UK a release may not be too far away. 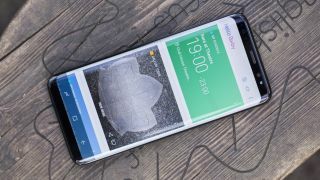 Bixby Voice should be available on both the Samsung Galaxy S8 and Galaxy S8 Plus in the future, while we also expect to see the tech on the Galaxy Note 8 later in the year.